With the inaugural launch of World Elephant Day yesterday, South African National Parks (SANParks) has warned that the country could not afford to be complacent about elephant poaching. The country has only experienced a few isolated incidents of elephant poaching, unlike many other African countries whose elephants are in crisis. The demand for ivory has skyrocketed, and it can now fetch more than $600 per pound (about R7 700) on the black market. This increased demand has sent poaching rates soaring, with an estimated one elephant killed every 15 minutes. According to SANParks large mammal ecologist Sam Ferreira, SANParks is applying an integrated approach in solving wildlife crime in general. He said elephants played a huge role within any landscape they inhabited. “They are habitat engineers. As charismatic species they awaken emotions among people like few other animals. As keystone species, they contribute significantly to the integrity of ecosystems. From an economic perspective, they are also value generators. SANParks, however, does recognise that elephants can also influence the well-being of people negatively,” Ferreira said. Ferreira said that SANParks’ integrated approach thus also focused on managing the effects that elephants have on people, the environment and the economic opportunities they create. Managing the effects of elephants on such a range of values is best done through restoring landscapes, such as closing boreholes that provide additional water and allowing natural processes to play out. SANParks illustrates these challenges and ways to deal with them at the Elephant Hall Museum in the Letaba Rest Camp of the Kruger National Park. The Elephant Hall covers elephant evolution, biology, behaviour, ecology and research. It also showcases the ivory of eight of Kruger’s greatest tuskers (including six of the Magnificent Seven) who are currently on display at the museum. 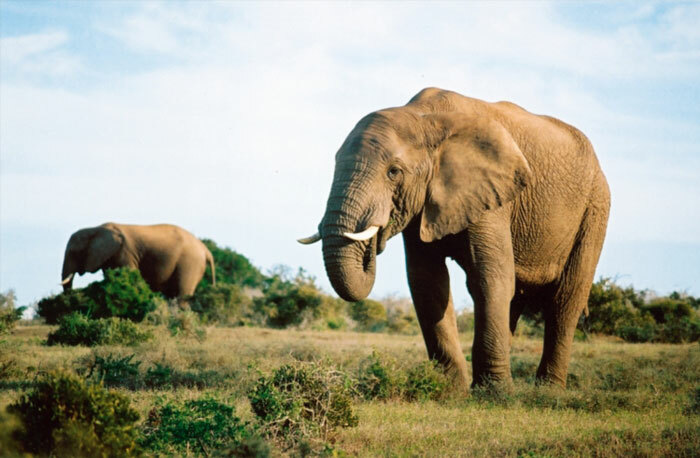 Apart from KNP, elephants can also be seen at the Addo Elephant National Park in the Eastern Cape, as well as in the Marakele and Mapungubwe national parks in Limpopo. In a paper issued by the South African Institute of International Affairs, researcher Ross Harvey found that more than 100 000 elephants had been illegally killed for their tusks, up to 2012. World Elephant Day was launched to focus attention on the urgent plight of Asian and African elephants.